This one perfect silver bracelet is all you’ll need for fashion perfection. Stunning multi row hammered cuff adds flair to any outfit. Shiny silver plate finish catches the light. 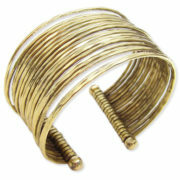 Open cuff easy to put on and adjusts for perfect fit. A substantial look with suprisingly lightweight feel. Also available in gold plated.